Don’t forget that Powerlifting (Hillside Canopy) will be giving out extra coins and XP all weekend! Be sure to follow Webosaurs and Spike to keep track of the attacks and what’s going on around the island in general. Because of Spike’s attempt last week, we will have to train now and prepare for the next attacks. In addition, Zing-a-Rock will be giving out extra coins and XP all weekend! 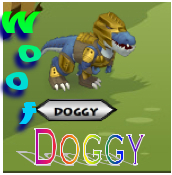 Doggy gives MORE Coin Codes!! Hey dino dudes! I got some more coin codes!! SO this is what i want you to do so that you can get a chance to get them first! I want you to stay on this blog BUT keep refreshing so that you can try and the coin codes first! The coin codes from me will be postponed until Tomorrow AfterNoon! I’m doing this because, of the time that it is and i want everyone to have an equal chance 🙂 Really sorry dino’s! Hey Dino’s!!! I just got a few coin codes to give away!!! BUT i won’t give them away just yet….. Keep checking back because i got 3 coin codes and you don’t want to miss this dudes! !